This post first appeared on The Spirit World in August 2006. Axis has been reinvented as Amber. And it’s not just a name and concept change but actually new owners are now running the show. The first difference that will jump out at you is that the interior has been completely redesigned. The bar area is much larger; the bar itself is now circular and larger; and there are graceful steps leading up to the second level. This new configuration has the added bonus of opening up the sight lines throughout the restaurant – no longer is the dining room hidden back behind the bar. It took me several attempts to get in for my first look, as every time I’d pass by the bar would be jam packed! And, although one of my favorite bartenders now works here on previous visits I didn’t see him and so decided to move on. Both of those things changed a couple weeks ago. M and I stopped by on a night when there was plenty of room at the bar and as a bonus Kirk was working that night, too! The drink menu is pages long. What they show online is merely a sampling of their offerings. What is interesting is that they have both a mix of old classics and new, fruity, youngster (as I like to think of them) cocktails. M ordered a Margarita which she really liked. 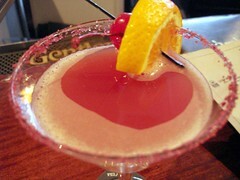 I had a Blood Orange & Vodka concoction (I neglected to record the actual name) which was also good. The one thing I did not care for about it was the use of the colored crystal sugar around the rim. Although this touch does add a festive look to a glass, in most cases it just adds too much sweetness to the cocktail, as it did for this one. Once I cleared a space on the rim, the underlying drink was tasty, though. We also ordered a couple of appetizers. 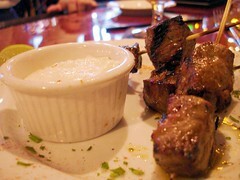 The Angus Beef Skewers with Horseradish Sauce were yummy! Beefy with caramelization, cooked until tenderly medium they were perfect with the horseradish sauce. My only suggestion on this would have been to make the sauce even more horseradish-y, but then again I like pure unadulterated horseradish so I might not be the best one to make this call! We also tried out the BBQ Prawns. These are wrapped in a smoked bacon and then grilled to perfection! 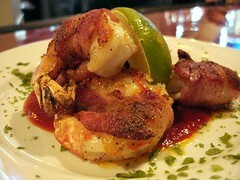 The yin-yang of the salty bacon with the sweet prawns was a perfect combination. They were served with house-made barbecue sauce on the plate. This sauce was very good – spicy and tangy with a hint of sweet – but I thought that it overpowered the delicate prawns. It was, however, great with the beef! And so we cross pollinated our plates for a wonderful taste experience. I like the look and feel of Amber. Next time I’m in, I’ll probably stick with the more classic cocktails. And I’m definitely looking forward to trying more menu items! 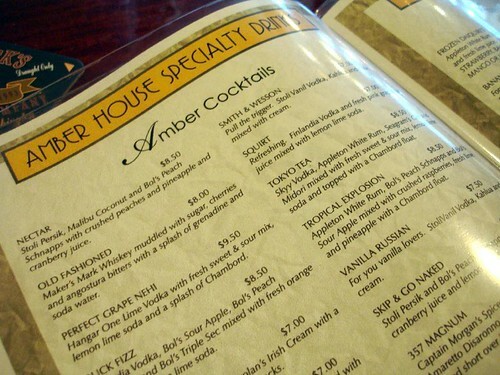 They have a Happy Hour which seems to include drink specials but I’m not sure about food – guess I’ll need to check that out! It runs 4pm-6pm daily with $5 well drinks and $3.50 drafts.